A brief post to pay my respects to the memory of my old prof, Philip Rahtz, who passed away last Thursday at the ripe old age of 90. You will doubtless be able to read elsewhere of Philip's enormously rich life and many achievements. For now suffice it to say that, in the field, he was (alongside others, including his friend Philip Barker) one of the pioneers of the techniques of open area excavation, the big break with the Mortimer Wheeler tradition of excavation, and of the combination of rescue archaeology and academic research. Philip was also one of the founders of serious archaeological interest in the 'sub-Roman British' side of early medieval archaeology, via his work on Somerset, and did enormous amounts for church archaeology as well. This limits his interests and activities to a very small sample, nonetheless. As well as field archaeology, Philip was always open to all the latest developments in archaeological theory and this made him a very fine choice as the first professor of the University of York's archaeology department - though with characteristic self-mockery he used to say that it was because they knew that, as he was then in his later 50s, they wouldn't have to put up with him for long if things didn't work out! I don't think it's too much to describe Philip as one of the last (maybe the last) of the really 'larger-than-life', heroic figures of British archaeology. 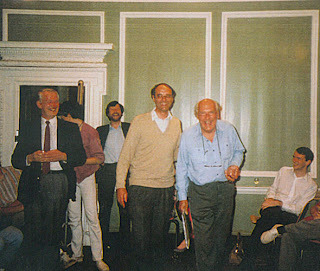 Thus Philip was my archaeology professor at York (I tend to think of Barrie Dobson, also in the photo above, as my history professor). Actually, I met him before I came to university when, after having taken my A-Levels I spent a couple of weeks on the York/Reading training dig at Bordesley Abbey, Redditch. Philip retired the same year as I graduated - with the first first-class degree awarded by the still-young department - and one of my most treasured possessions is the book he gave me, inscribed 'to Guy, whose beginning coincides with my ending.' Of course it was anything but an ending as Philip had a quarter of a century of contributions left to make. 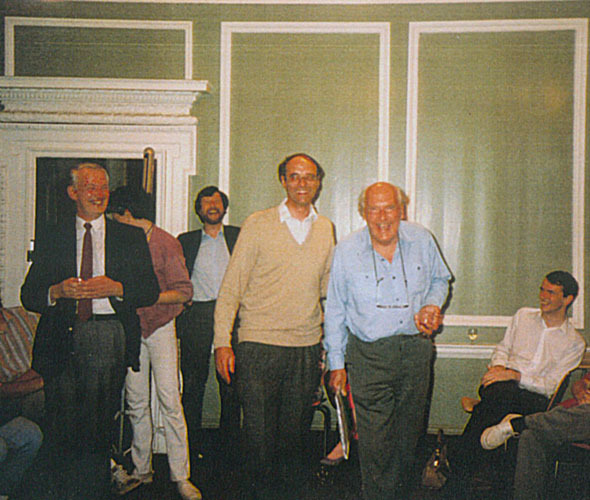 Many, many people will be able to talk with much more qualification about Philip as an archaeologist and about all the fun and laughter that - as well as his scholarly contributions - always be associated with his memory (the photo above captures this pretty nicely). He had a wicked sense of humour and loved to tease and shock more straight-laced members of the academic community. Others will have a boundless fund of better stories than I can tell on that front. The tale I want to tell is a bit different and I've chosen it because it shows just that there was a lot of sensitivity and humanity behind his sometimes mischievous exterior. I mentioned that the first dig I ever went on was at Bordesley Abbey, in the last season (I think) that Philip oversaw the excavations. As a result it was there that I received my A-level results. My Dad drove across from Stourport with the fateful envelope (having been telling people the night before that I'd be lucky to get two Cs with the amount of work I'd done...). Sensing the nerves (I think my dad's were greater than mine), Philip swooped in and swept him off to look at the traces of the rood screen ("terribly important") that had just been unearthed in the church, to leave me to open the envelope on my own - well aware that a fifteenth-century rood-screen was the last thing on my Dad's mind. Anyway, suffice it to say that I did get the grades needed to join Philip's department and the rest, as they say, is history (or history and archaeology equal honours, to be exact). Anyway, it made Philip one of my father's favourite people (as well as one of mine) and sums up Philip's sensitivity and charisma. Rest in Peace, Philip. You'll be missed. It'll be a crowded church on Friday but you'll always have known that it would be.